Dorf on Law: Should Democrats Kiss Trump’s Ring? One problem with flattering Trump is that his policy shifts are only partly due to his ginormous but fragile ego. They also reflect his ignorance and limited attention span. Consider China. Everybody who made even a casual study of the issue knew that Trump was dead wrong about China's monetary policy during the campaign. China did manipulate its currency (i.e., keep the RMB artificially low relative to the dollar and other currencies in order to boost exports), but it stopped doing so many years before Trump made Chinese currency manipulation a campaign issue. It's possible that Trump knew this all along, but given how little Trump knows (even about things that one would expect a tycoon to know something about), it's more likely that he simply formed a view about China and currency manipulation based on something he heard in the early 1990s and never bothered to update that view because he doesn't read anything longer than a paragraph unless it has his name in it. Trump's habit of pronouncing truisms (e.g., health care is complicated) as though they are great insights reveals that even a brief encounter with the truth can lead to the sort of change of mind that accompanies an epiphany. But that means that a sycophant trying to sway Trump through flattery and a side order of reality faces two related risks. First, there is the possibility that another sycophant with a contrary agenda will have a later conversation and flip Trump back against your position. There is little point to influencing a guy who believes the last thing he was told if you're not going to be the last one to speak with him. Second, getting Trump to change his position only really works if he has something resembling a coherent position that he can then pursue. In general he doesn't, as his going all in with the Saudis illustrates. 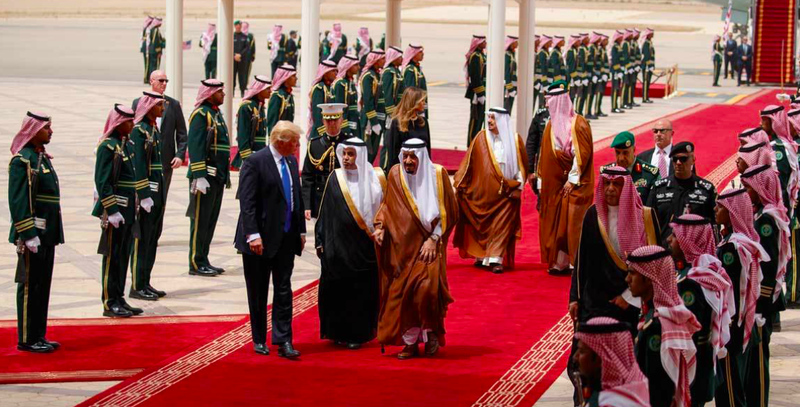 By backing the Sunni side in the regional Sunni/Shia conflict, Trump makes it harder to achieve one of his other ostensible goals: rapprochement with Russia over Syria, where the Russians and the Assad regime are closely allied with Shia Iran. Isolating Iran to please the Saudis is inconsistent with engaging Assad to achieve a negotiated resolution to the Syrian civil war. It's easy to imagine a version of each of these difficulties playing out over domestic matters. Suppose Democrats decide to flatter Trump in order to induce him to push an infrastructure spending program. It's easy to imagine Trump reaching an agreement to fund infrastructure only to back off when fiscally conservative Republicans tell him that they oppose infrastructure spending and either flatter him or flex their muscle on other matters. At that point, we can imagine Trump or one of his minions providing an explanation along the same lines as Mick Mulvaney provided to explain why Trump's proposed budget violates his promise not to cut Medicaid: that the promise to repeal Obamacare overrides it. Team Trump would simply announce that the promise to spend on infrastructure was overridden by the promise not to add more debt (except by cutting taxes for the wealthy). There's also a disanalogy that puts Democrats in a tougher position than the position in which foreign leaders who want to curry favor with Trump find themselves. With the exception of Vladimir Putin, foreign leaders more or less take the American leadership as they find it. Democrats, by contrast, want to moderate Trump if possible but mostly want to displace him and the GOP Congress. Working with Trump to obtain policy concessions could have the effect of legitimizing him in the eyes of the electorate. If the policy concessions are very substantial, that could be a price worth paying, but if (as I expect) the concessions will be modest and ephemeral, it is not. 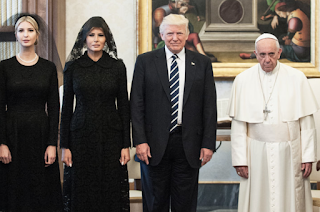 As the dour expression on the face of Pope Francis indicates, treating Trump as a more or less normal human being, much less as an honored guest, must be dispiriting for any self-respecting person. If it must be done to serve the greater good, so be it, one might tell oneself. But Democrats in the U.S. are in the fortunate position of standing little to gain and much to lose by debasing themselves to flatter Trump. Unfailing opposition is both the honorable approach and the smart play. Thanks for the post , the post raises many issues , above all , suggests flaws in the personality of Trump ,and I am not so sure , that lack of experience , lack of skills , lack of knowledge is not the real issue . Time maybe is needed , he may learn and improve it . It is not so simple to be the president of the US , let alone over night , after being no more than bit more than real estate agent .
" Isolating Iran to please the Saudis is inconsistent with engaging Assad to achieve a negotiated resolution to the Syrian civil war. " But, The main problem with Iran, and that was also the view of the previous administrations , is the nuclear weapon (hypothetical) and funding and supporting terror all over the world . The issue of reaching agreement in Syria , in the eyes of all administrations , is totally subordinated to the nuclear and terror issues. "If the policy concessions are very substantial, that could be a price worth paying, but if (as I expect) the concessions will be modest and ephemeral, it is not." Bottom line. Normalizing Trump on one side requires very high benefits on the other. The Republican leadership figured the net was worth it. I don't think the Democrats should. This was true regarding accepting Neil Gorsuch and don't think relatively minor improvements on some infrastructure bill or something will either. Now, let's be clear, as Obama might say. This in the short term will hurt. Support behind the scenes will in various cases get something of value. Democrats might at times do this in Congress -- see, e.g., the agreement to keep the government running for the next few months that from what I can tell was better than we might expect. But, that is different from "kissing Trump's ring."